thy Word, our law, thy paths our chosen way. all glory, laud, and praise be ever thine. Daniel C. Roberts (b. Bridgehampton, Long Island, NY, 1841; d. Concord, NH, 1907) wrote this patriotic hymn in 1876 for July 4 centennial celebrations in Brandon, Vermont, where he was rector at St. Thomas Episcopal Church. Originally entitled "God of Our Fathers," this text was later chosen as the theme hymn for the centennial celebration of the adoption of the United States Constitution. It was published in the Protestant Episcopal Hymnal of 1892. Educated at Kenyon College, Gambier, Ohio, Roberts served in the union army during the Civil War. He was ordained in the Episcopal Church as a priest in 1866 and ministered to several congregations in Vermont and Massachusetts. In 1878 he began a ministry at St. Paul Church in Concord, New Hampshire, that lasted for twenty-three years. For many years president of the New Hampshire State Historical Society, Roberts once wrote, "I remain a country parson, known only within my small world," but his hymn "God of Our Fathers" brought him widespread recognition. Unlike many other nationalist hymns, this text keeps our focus on God. This is a God who created the universe, who leads and governs his people, who serves as our protector, and who refreshes his people with divine love. Presumably the text referred originally to white Anglo-Saxons, but in its present form it is fitting for all citizens and residents of any country. Christians too may sing this anthem, using it to recognize the national association we have on earth but remembering that the practice of "true religion" (st. 3) transcends earthly loyalties and promotes citizenship in the kingdom of heaven. Worship that focuses on God's reign over the nations; civic celebrations. Roberts' text was initially sung to Alexy Lvov's RUSSIAN HYMN (199), but in 1892, right after the text was accepted for the Episcopal hymnal, George W. Warren (b. Albany, NY, 1828; d. New York, 1902) composed NATIONAL HYMN for Roberts' text. 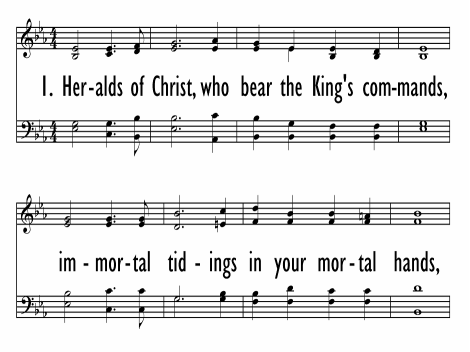 The new tune was published with Roberts' text in the Hymnal Revised and Enlarged (1894), compiled by J. Ireland Tucker and W. W. Rousseau. Warren received his general education at Racine College in Wisconsin, but as a musician he was largely self-trained. An organist in a number of Episcopal churches, he played the organ for thirty years (1870-1900) at St. Thomas Church in New York City. Warren composed anthems and liturgical service music; his hymn tunes were collected in Warren's Hymns and Tunes as Sung in St. Thomas Church (1888). Though the great hymnologist Erik Routley (PHH 31) dismissed NATIONAL HYMN as "a pretentious piece of bombast," many people enjoy singing it with the gusto appropriate to civic events. The tune includes martial trumpet fanfares, which may give too much of a triumphalistic effect in church. Use more humble musical forces, especially on the inner stanzas.